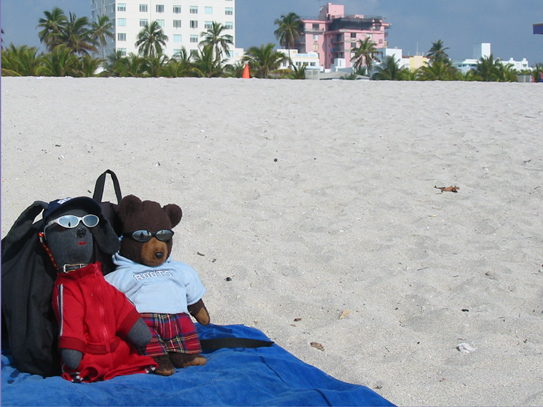 The boys made their first trip out of the country in April 2004 when they headed down to Miami for some fun and frolic in South Beach. Seeking some relief from the relentless sun. It being their first time going south, the boys really weren't prepared for the heat and didn't bring appropriate beach attire. Checking out the sights on the Lincoln Road Mall. Bow Wow indulged Bear's sense of the macabre and posed with him for a photo in front of the Versace mansion, where Gianni was shot in 1997. Move your mouse over the picture to see the boys close up.